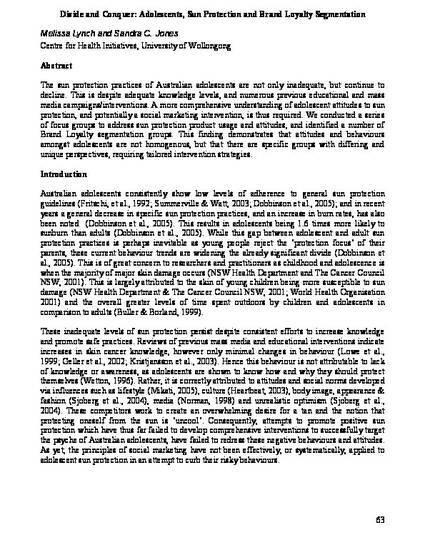 This conference paper was originally published as Lynch, M and Jones, SC, Divide and conquer: adolescents, sun protection and brand loyalty segmentation, Proceedings of the Social entrepreneurship, social change and sustainability: International Nonprofit and Social Marketing Conference, Brisbane, 27-28 September 2007. The sun protection practices of Australian adolescents are not only inadequate, but continue to decline. This is despite adequate knowledge levels, and numerous previous educational and mass media campaigns/interventions. A more comprehensive understanding of adolescent attitudes to sun protection, and potentially a social marketing intervention, is thus required. We conducted a series of focus groups to address sun protection product usage and attitudes, and identified a number of Brand Loyalty segmentation groups. This finding demonstrates that attitudes and behaviours amongst adolescents are not homogenous, but that there are specific groups with differing and unique perspectives, requiring tailored intervention strategies.